MANAGUA, NICARAGUA: Managua is the capital and the largest city of Nicaragua. 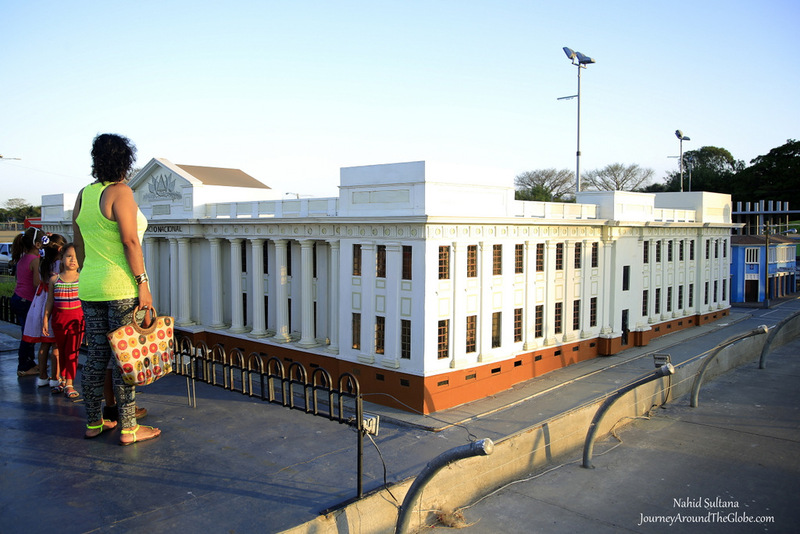 This is not your typical capital with only high-rise buildings and bunch of traffic lights. It has history, culture, and heritage as well as some stunning natural beauties. Though Managua is the industrial or commercial center of the country, it’s not outrageously expensive like its neighboring capitals. From hotels, to food, to transportations…everything is cheap compare to United States. Unlike Panama or other Central American countries, Nicaragua has its own currency, called Cordoba. You can use USD too, but the change may be in Cordoba. TIME of TRAVEL: After visiting El Salvador, Panama, and Costa Rica, Nicaragua concluded our Central America tour which we took back in March, 2015. We had two days to spare before returning to our home in Oregon. First day was well spent in Managua and the last day we had booked a guided tour with viator.com to visit Masaya and Granada. It was pretty hot and humid in Managua, but I guess not as bad as El Salvador. Still it’s always better to be prepared with lots of sunscreens, hats, comfortable shoes, and plenty of water bottle when you come to this region around this time of the year. 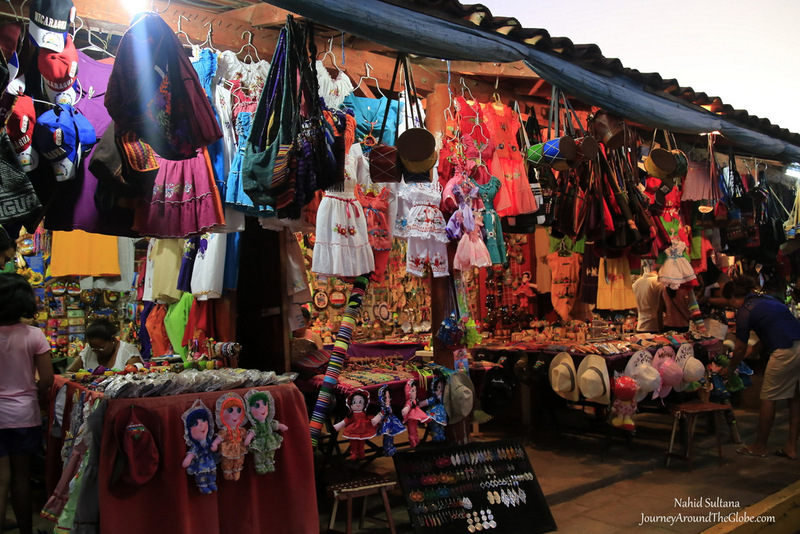 EATING and SHOPPING: Managua is a scattered place with shops and restaurant at every corner and on every street. But from the following places we’ve visited, Puerto Salvador Allende is probably the best place to pick a local restaurant and hunt for some souvenirs. Yes, you have to bargain when you are in Central America. Souvenirs are very colorful with lots of rainforest and natural influences but very reasonably priced. PLACES WE’VE VISITED: We were in Nicaragua for 2 days. First day was for the capital and the next day, we took a day trip to Granada and Masaya. One day was good enough to get a good glimpse of Managua. These are some of the places we were able to visit by renting a cab. 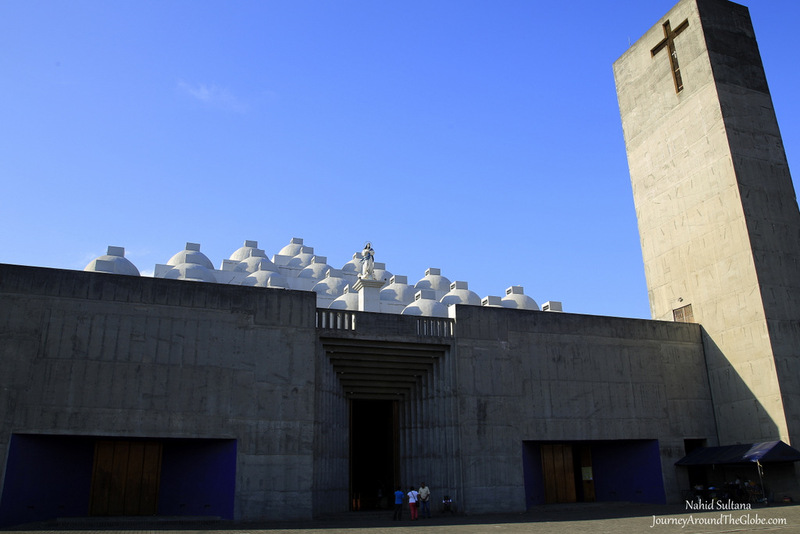 NEW CATHEDRAL or CATEDRAL de MANAGUA: This is a contemporary and unusual cathedral built in 1993. Because of its 63 domes on the roof, it looks a lot like a mosque. Inside, it is still unfinished and simple, but worshippers come here everyday. Look for the Black Christ in one of the chapels, very popular in Central America. Rows of tall palm trees decorate the square in front of this cathedral. 2) MONUMENTO del EQERCITO de NICARAGUA: From the cathedral we drove about half an hour or so to go to the Mirador Lagoon. This monument came first after entering the complex. We were there only for couple minutes. But this is a white patriotic monument with canons and symbols. 3) MIRADOR TISCAPA or LAGOON: From the monument, we were taken to Mirador Lagoon in just few minutes. Although it could have been maintained better, this is a place where locals come to relax or take a break from the chaotic city life. The fresh water lagoon itself is inside of a crater of an extinct volcano. We saw lots of young couples and groups chilling by the lake. It was 5 NIC to enter the park. 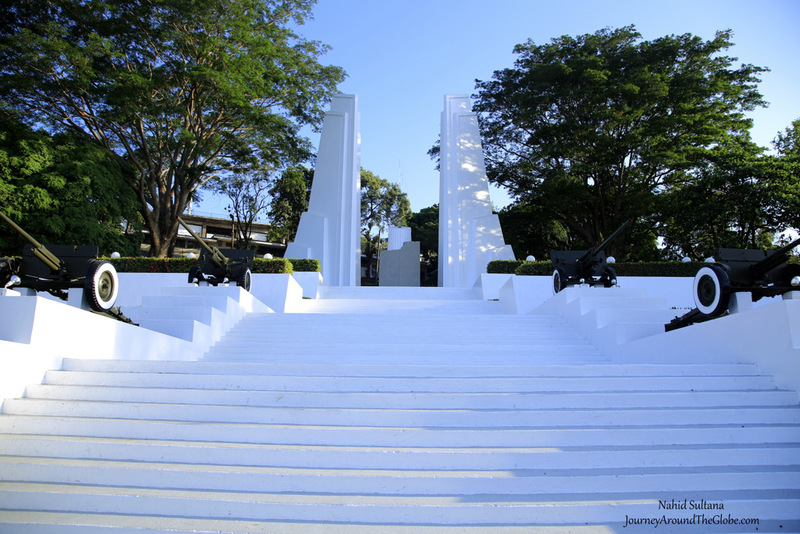 4) PARQUE CENTRAL de MANAGUA: Parque Central de Managua is a big open space at the center of the capital. This is another point where hundreds of locals gather everyday to get away from the city life within the city. After parking the car, we passed some statues and war monuments to come to the main square. Antiqua Catedral de Managua, orange building of Presidential Palace (La Casa de los Pueblos), and National Palace (Palacio Nacional) are located here. Antiqua Catedral de Managua or the Old Cathedral was under renovation, so we couldn’t go in. 3 eternal fire to honor Nicaraguan revolutionary leaders are located in front of the square. We were there after the regular office hours, not sure if the tourists can take tour inside the Presidential Palace or the National Palace. But we were told by our cab drive that President Daniel Ortega doesn’t live in the Presidential Palace. Overall, this was a nice hangout place for us in the late afternoon. If you are hungry, there are some food stalls too. 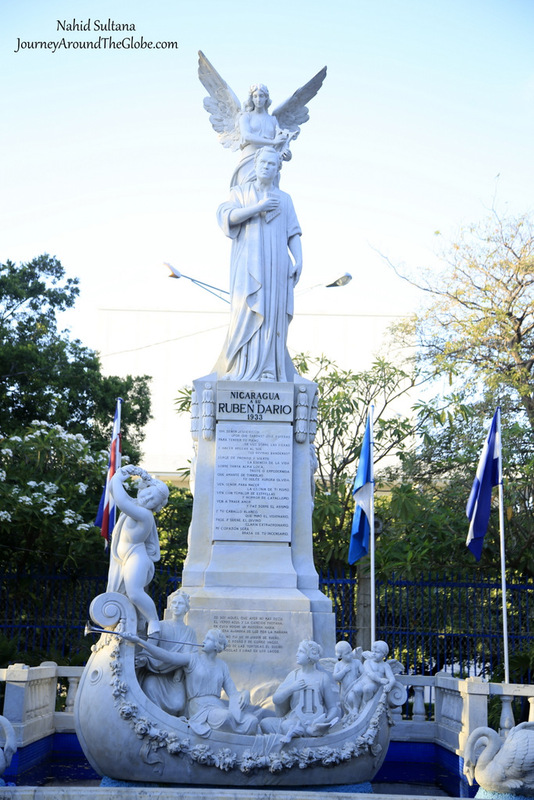 Check out the beautiful monument of Ruben Dario near the entrance. Also you can see Lago Xalotlan from here. 5) MINI MANAGUA: Not too far from the park, we then came to the lake shore. 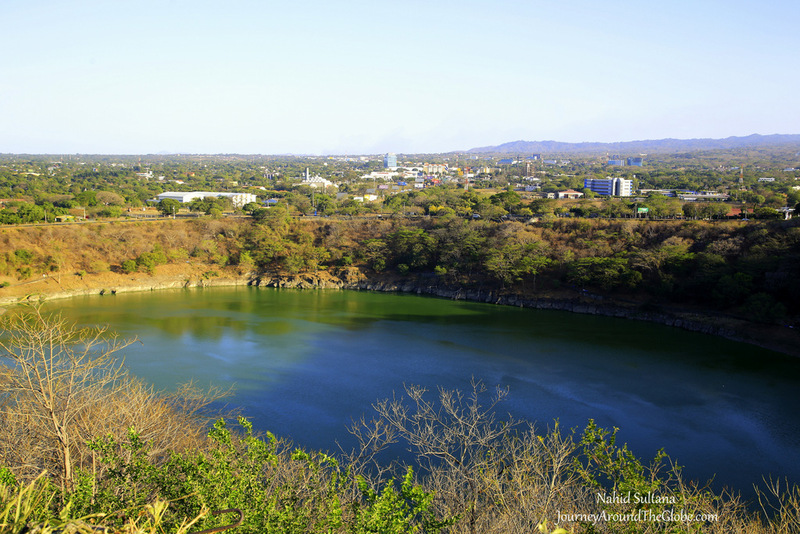 Mini Managua, a fun park with miniature version of the city, is located by Lake Managua. The park features some of its important and historic buildings, businesses, and iconic monuments. My kids loved seeing all the mini stuff and taking a tour inside a mock airplane. There were some cafes and picnic areas here and a long path by the lake for strolling. The government doesn’t allow any kind of boating here to protect the lake from pollution. It’s 30 NIK to enter and can easily spend couple hours. 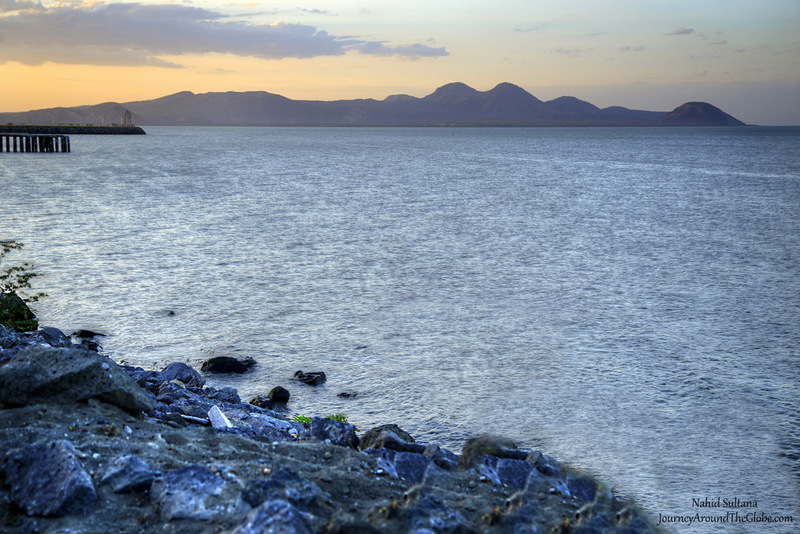 6) PUERTO SALVADOR ALLENDE: This was probably my most favorite place in Managua. It was already dark when we reached here from Mini Managua. The drive was only few minutes from the last park, but parking is a headache here. 30 NIC to enter with car and 5 NIK per adult. This is more like an eating and shopping place. It was bustling with a hundreds of local crowds gathered for meals and good times. This is probably one of the best places to try some local delicacies. Loud music was everywhere…a nice hyped place to chill at night. 7) ROTONDA RUBEN DARIO: We just drove by this round-about at night without stopping. It is lit up at night and looks extravagant with the mixture of fountain and light. Sorry to hear that…it’s no fun when you get robbed in a trip. I liked Managua, but more than that I liked the other surrounding small villages.